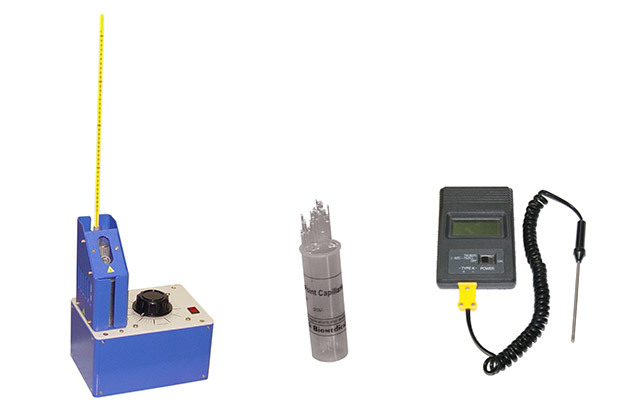 It can be used in determining repeatable melting point of different compounds up to 400°C in 5 minutes by continuously adjustable with built-in variable transformer. Temperature resolution 0.1°C with low mass thermocouple and precision thermometer. Its housing is made of aluminum. It accepts up three capillaries. Samples are illuminated and clearly visible through the precision 6-power lens. Operatable at 220V AC. Cat. No. Item Name Qty. * Note: No part of this website may be reproduced, stored in a retrieval, or transmitted in any form or by any mean. Design & aesthetics are subject to change without prior notice due to our continuous R&D efforts for product improvements. © 2015 OSAW Industrial Products Pvt. Ltd. All Rights Reserved.